Decompiled source code for the SLocker android ransomware, which saw a six-fold increase in the number of new versions over the past six months, has just been published on GitHub and is now available to anyone who wants it. The SLocker source code has been published by a user who uses 'fs0c1ety' as an online moniker and is urging all GitHub users to contribute to the code and submit bug reports. SLocker or Simple Locker is mobile lock screen and file-encrypting ransomware that encrypts files on the phone and uses the Tor for command and control (C&C) communication. The malware also posed as law enforcement agencies to convince victims into paying the ransom. Famous for infecting thousands of Android devices in 2016, security researchers discovered more than 400 new variants of SLocker ransomware in the wild in May, and just after a month, the nasty Android ransomware was spotted copying the GUI of WannaCry. Once infected, SLocker runs silently in the background of a victim's device without their knowledge or consent and encrypts images, documents and videos on mobile devices. Once it has encrypted files on the device, the Android ransomware hijacks the phone, blocking its user access completely, and attempts to threaten the victim into paying a ransom to unlock it. 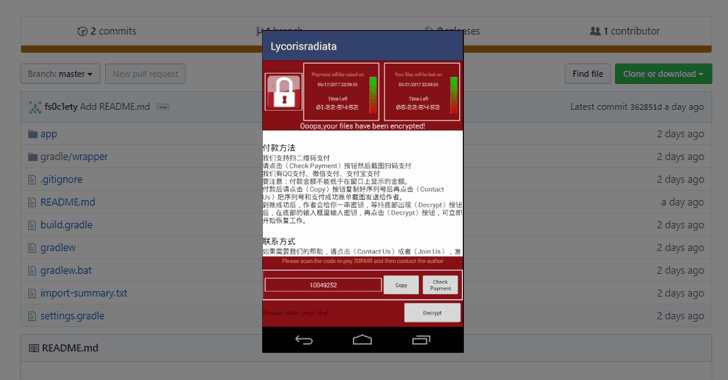 Being in action from 2015, SLocker stands out as one of the first ransomware samples to encrypt Android files. The malware has modified beyond just locking screens and demanding payment to taking over administrative rights and controlling the device's microphone, speakers, and the camera. And now since the source code of this nasty Android ransomware has been released online on GitHub, Android devices are most likely to receive an increasing number of ransomware attacks in upcoming days. The leaked source code would be a golden opportunity for those who always look for such opportunities as these kinds of malware programs are only offered for sale in underground forums, but SLocker is now accessible to cybercriminals and fraudsters for FREE. Earlier this year, researchers discovered a variant of BankBot banking trojan in the wild which was developed using the leaked source code for the malware on an underground hacking forum. Last year, the source code for the MazarBot (improved version of GM Bot) was also leaked online by its author in order to gain reputation on an underground forum. Never click on links in SMS or MMS messages. Even if the email looks legit from some company, go directly to the source website and verify any possible updates. Go to Settings → Security, and Turn OFF "Allow installation of apps from sources other than the Play Store." Always keep your Android devices, apps and Antivirus app up-to-date. Avoid unknown and unsecured Wi-Fi hotspots and keep Wi-Fi switched off when not in use.